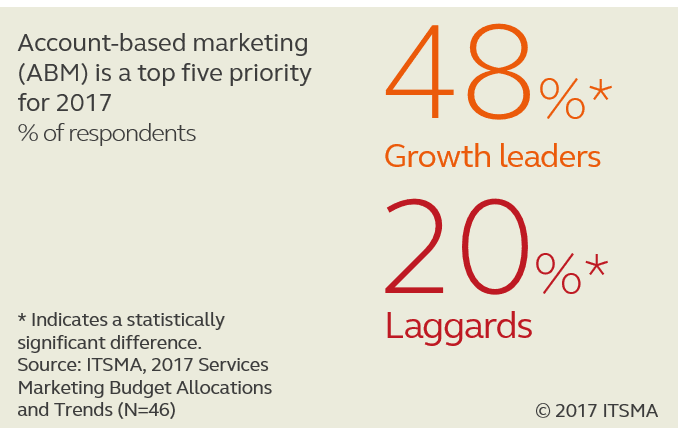 ITSMA’s latest Services Marketing Budget and Trends study identifies some important differences between high-growth and other companies in terms of marketing priorities and investments. One of the most important differences is in the focus on Account-Based Marketing (ABM). Amid all the recent hype, we were a bit surprised to see that ABM ranks only as the fourth highest priority for B2B services and solutions marketers in 2017. Only 33% of our survey participants included ABM among their top five priorities. Brand and differentiation, lead generation, and marketing performance management all ranked higher on the list. For the growth leaders in our study, however, ABM sits much higher on the list. About half of the high-growth companies included ABM among their top priorities vs. only 20% of the laggards. The difference is statistically significant, suggesting a strong connection between ABM and overall performance. More generally, however, interest and investment in ABM continues to grow. About half (46%) of the companies in our study are already doing ABM, with Strategic ABM and ABM Lite being the most popular approaches. Another 26% of companies plan to get started in the next 1-2 years. For those companies with programs already in action, marketers on average expect to spend 17% of their total budgets on ABM this year, more than double the 8% dedicated to ABM two years ago. Anxious to get started or accelerate your own program? ITSMA’s new book, A Practitioner’s Guide to Account-Based Marketing: Accelerating Growth at Strategic Accounts, provides the definitive guidance and lessons learned from years of ITSMA experience, including case studies from ABM leaders, including BT, Cisco, Cognizant, and more. Want to know more about the budget study? Send me a note.